What’s Cool About Resource Allocation? One of the hardest parts of workflow management is efficient resourcing. In fact, according to the 2016 In-House Creative Services Industry Report, 50% of internal creative teams rank it their single greatest challenge. As today’s industry continues to demand more work from creatives than ever before, effectively managing how different team members’ time and energy are used can feel impossible. Tons of creatives experience regular stress and fatigue from having too much on their plate, with no way to adequately communicate their pain points. In fact, a survey conducted by The Creative Group found that 43% of creatives regularly work 50 hours or more per week. At the same time, creative leaders tasked with executing multiple projects often struggle to balance the workloads of team members across disciplines. That same Creative Group survey found that a whopping 62% of marketing and advertising executives bring work home with them on the weekends. Properly balancing workflows can help alleviate the burden on creative teams by improving their ability to execute work as efficiently as possible. And that’s where inMotion’s new resource allocation capability comes in. The new feature was specifically designed to help marketing and creative teams simplify their workflow by easily balancing workloads, accurately tagging resources, and effectively planning projects. That means preventing task assignees from being overloaded, effectively eliminating frustration and missed deadlines, and arming teams with the insight they need to plan better. 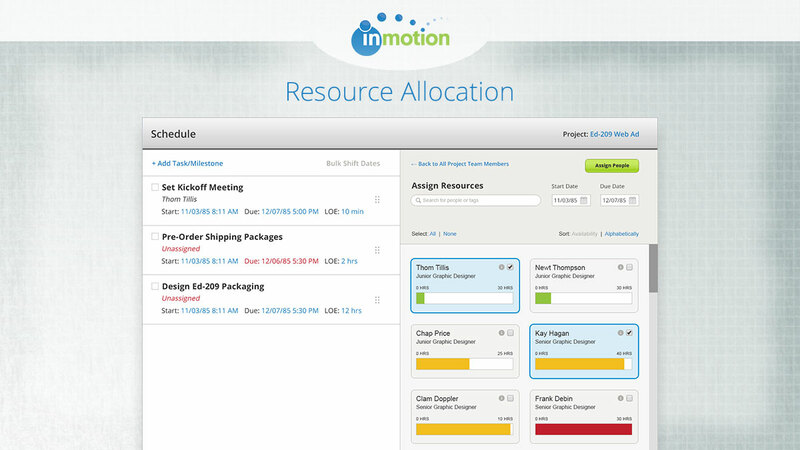 Using inMotion’s resource allocation capability is just as simple as the rest of the application—and just as powerful. New color-coded capacity bars make it easy for project leads to see the workload of multiple team members in one place, so they can quickly decide who has the bandwidth for new work—or who’s current workload puts them at risk of not completing their tasks on time. Resource allocation also features intuitive task and people tags, so users can match the right people with the right tasks based on relevant criteria, like skills and availability, and divide work as efficiently as possible. Plus, a new flex date capability gives users quick insight in to how new tasks will affect team workloads, even across multiple due dates. That means it’s easier to forecast timelines, meet deadlines and reduce bottlenecks. Creative teams might still be faced with more work than ever before—but efficiently allocating resources is one of the best ways to ensure consistent delivery on the demand. Learn more about resource allocation, or experience it yourself.